Anantara has opened a new hotel in Bangkok despite the recent floods across Thailand. 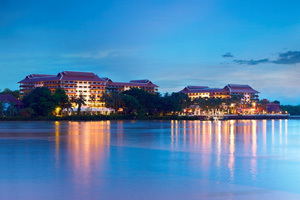 Anantara Bangkok Riverside Resort & Spa is set in 11 acres of landscaped gardens by the Chao Phraya River. It has 407 rooms, a fitness centre, outdoor pool, spa and ten restaurants and bars. Anantara also plans to open Anantara Rasananda Phangan Villas Resort & Spa on Koh Phangan by the end of the year. Minor International chief executive officer Dillip Rajakarier said: "Minor Hotel Group, Anantara’s owning company, is confident that the Thai tourism market will bounce back quickly from these recent floods. Over the last few years, the country and market have shown an ongoing resilience to diverse challenges and Anantara is confident that this will once again be the case." The news comes despite current advice by Foreign and Commonwealth Office advising against all but essential travel to the city of Bangkok and 25 provinces identified by the Thai authorities as affected by flooding. A statement on the FCO website advised: "Our advice against all but essential travel to the city of Bangkok does not include transit through Suvarnabhumi international airport. Flights to destinations elsewhere in Thailand (e.g. the resorts of Chiang Mai, Phuket, and Koh Samui) continue to operate normally. We advise against all travel to the Preah Vihear, and Ta Krabey and Ta Moan temple areas and against all but essential travel to the provinces of Pattani, Yala, Narathiwat and Songkhla."